We blame playwright and literary genius Hemingway for the bad press bestowed upon spotted hyenas. His unfounded fear and clear disregard for our unique crocuta crocuta species deserves more than a few eye rolls from our side. It’s not only that hyenas were branded shameful demonic beasts in the classics, but in African and Persian folklore they are feared. And they’re often cast as the villain in Disney movies (do you remember Shenzi, Banzai, and Ed from Lion King?). Human beings have a tendency to hate and shame what we fear. Lack of understanding can breed hatred, and hyenas are most certainly misunderstood. All that Hemingway and the others needed was to understand the role of the hyena in the wild, and to witness their adorable ways. 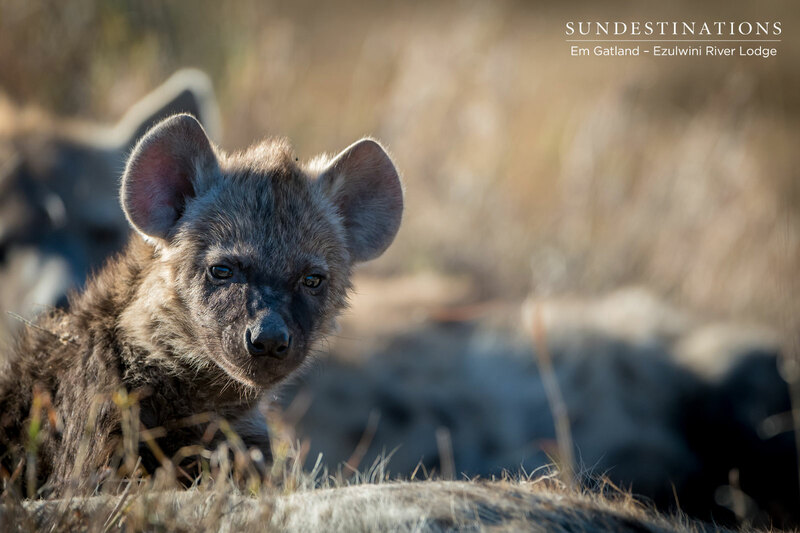 One look at the recent litter of hyena cubs spotted at the den site on Ezulwini Game Lodge’s traverse will change your attitude towards hyenas. If only Hemingway could have joined a game drive with Angele and the team, his famous line “Hermaphroditic, self-eating devourer of the dead, trailer of calving cows, ham-stringer, potential biter-off of your face at night while you slept, sad yowler, camp-follower, stinking, foul with jaws that crack the bones the lion leaves …“; may well have changed to a description far less loaded with contempt. The hyena den while spotted on drive with Ezulwini showed us a more endearing and cuter side of hyenas. Hyena cubs are completely helpless when they’re born and actually look just like staffie puppies. When the cubs start growing they first develop somewhat soft, almost fluffy hair, which becomes coarse as they mature and are able to hunt/scavenge for themselves. Coarse short fur is easy to clean after huge gory feast of carrion and carcass. You’ll notice that one of the guides in the video says, “the hyena form part of the ugly five”, but not when they’re cubs! It’s always cause for celebration when you spot hyena during the best looking years of their life. I guess Hemingway never spotted a hyena cub?! Perhaps his perception would have shifted somewhat. Spotted Hyena aren’t naturally pretty or regal, which doesn’t leave a lasting first impression. Their coarse fur, flattish bone-crushing heads and awkward gait leaves little to be desired in the looks department. Despite not bearing the hallmarks of the more poster-child-oil-painting animal; the hyena’s body is perfectly built for its role in the wild. As a result, this species is actually one of the MOST successful carnivores in the animal kingdom. Not only are they brazen and brave scavengers, but they’re also incredibly proficient hunters that possess a rather admirable level of social intelligence. During the time that Rogan spent at the den site, he learnt that there were 2 cubs stashed in the den. The mother will raise her cubs in the seclusion of the den until they are 18 months old, after which the sub-adults will feast on meat from kills located around the den. Rogan learnt that there are a actually a few den sites within the area, and these youngsters are bound to be here for quite sometime. They have a variety of vocalisations ranging from chortles to giggles. Each vocalisation indicates an emotion : anxiety over a kill, calling the clan members and excitement at the dinner table. They clean-up after the messy big cat eaters, and remove debris from abandoned kill sites. This helps to prevent the spread of possible disease. They are opportunistic and will scavenge first, but are perfectly adept at hunting. They hunt via a method called “coarsing” which is similar to that of the African wild dog. They have stamina and will chase prey until the point of exhaustion. They will stop at nothing to feed themselves and the other clan members. This includes wading through water. The Ezulwini traverse has abundant lion pride sightings, which means there’s an ample supply of food for the clans. We trust we’ve dispelled the myths surrounding hyena!